Zebra Jumping Spider who got to live. 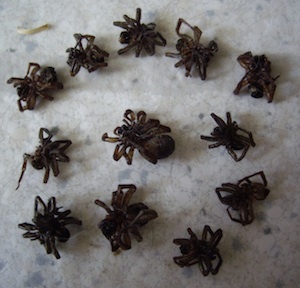 Dead spiders are truly awesome! By definition, a dead spider means that you now know exactly where the spider is and that it is no longer creeping around your home, undetected. It would appear this year that there is a county-wide spidee reunion scheduled IN our house. In the time span of just over a week late this spring, I killed at least 25 spiders, mostly in our kitchen and of course, at night. They are all about the same size and black (except for the big hairy brown one I totally squashed—he was too far gone to make it into the picture). They are not black widows as we had hundreds of those at our last owned home. These are more furry than shiny and no red hourglass. This unfortunate inconvenience in my life all started with Genesis 1:24: Then God said, “Let the earth bring forth living creatures after their kind: …creeping things…” Did He HAVE to include spiders?? And my next question: if He had to make spiders, couldn’t He have made them a little more presentable? Perhaps a little less fangy? I know that God said everything He made was “very good.” But spiders? C’mon! I noticed in Genesis 6:20 that when God sent the flood, he sent spiders into the boat: “Of every creeping thing of the ground after its kind, two of every kind will come to you to keep them alive…” Can you imagine Noah’s wife being in agreement with this arrangement? For a whole year, she had to deal with creeping, hairy, lightning fast spiders in quite a confined space. How could a woman get any sleep? She probably got the adventure of dealing with spider babies too. Have you ever seen a hatching of spiders? Imagine the bursting of Hoover Dam when all those little spider juniors come forth, running in every direction, looking for a Miss Muffet. In this case, a Mrs. Noah. Just a few days into spider awareness campaign. My husband always accuses me of exaggerating on these things. So the very day I announced that I had begun collecting 8-legged friends (only since the day before), I had the picture ready to prove it (see picture). What could he do? He apologized for being so skeptical. Okay, in all fairness, I know spiders can have their place. Scientists say there is something about the balance of nature involved. Yes, they are great at keeping the mosquito population down, but why not just eradicate both? But, my negativity may be overkill (excuse the pun). I am sure in their own way, they are quite, um, interesting. I can go so far as to say that some of them are even beautiful in their own way—but only if they are not in my house. For instance, I once found the zebra spider (at top) on a hiking trail near my home. 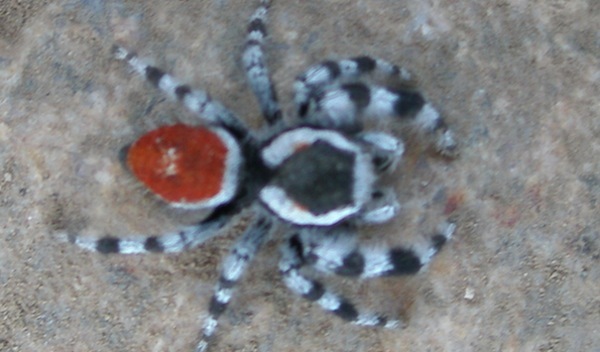 I thought he was one of the most amazing spiders I had ever seen. I could appreciate him because he was out in nature where he belongs. If you are a spider, and you stay outside, you may live. If not, well, deal with it. I think I’m being MORE than fair. P.S. Do you think the commandment “Do not kill” implies spiders too? I have wondered about that since it doesn’t specify humans. Aack! Hey Care Bear…we are like hearts through and through. Let me know if you get this comment (reply). I am just getting it all set up and didn't even know you had commented. Lotso love! Hello! I extremely appreciate the useful writing you’ve done to this site. In fact, I have also been producing a message board on all topics of the sciences. We’re now using a tool from ZetaBoards to make our forum but we’d also like to make an news site for all topics of science. Do you use wordpress for your site? Anyways, please take a look and hopefully you like our board. Congratulations for notice much a important blog. Your diary isn’t exclusive illustrative but also extremely artistic too. There ordinarily are extremely twosome of individuals who can create not so gentle articles that creatively. Hold up the peachy work !! Many thanks for this article. I’m a little bit more educated after reading this. :). Continue publishing, please. Now I should go back to my duties, my boss is coming :). Take care! thanks for the info, have subscribe to your blog, hope it will come out more stuff like this. It is Thursday and I am going to not go into work – yea!. I hate working the night shift. I was just sitting in Starbucks with my new iPhone surfing the internet and killing time before going home. I just came across your website and wanted to let you know how well your site looked on a mobile device. Your website shows up perfectly so you know anyone with an iPad or iPhone can also enjoy the material on your site. Its like you read my thoughts! You appear to understand a lot about this, such as you wrote the e-book in it or something. I think that you simply can do with a few % to power the message home a little bit, but instead of that, that is great blog. A fantastic read. I’ll definitely be back. Howdy! Quick question that’s completely off topic. Do you know how to make your site mobile friendly? My site looks weird when browsing from my iphone 4. I’m trying to find a template or plugin that might be able to fix this problem. If you have any suggestions, please share. Many thanks! Very nice blog, I must add you to my rss! Great! Thanks for the post!